In need of a tune up. 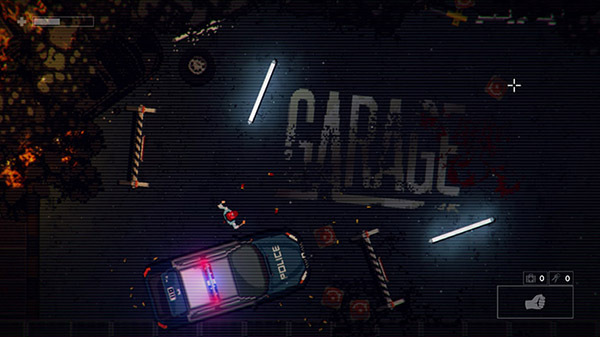 Garage is a top down indie shooter/brawler with leanings towards early Resident Evil games of all things, and a plot that feels like it was taken from a Breaking Bad fan-fiction. If that sounds confusing, don’t worry, it only gets even moreso when you play the game. The narrative revolves around a man named Butch, who wakes up without his memories underneath a ruined shopping center in the midst of a bunch of burning cars and zombies. From there, Butch has to figure out what happened to leave the area in such a disastrous state as well as what role he inevitably played in it, while killing various undead creatures and scavenging the various areas for guns, ammunition, med kits, and dog food. From beginning to end, the plot spirals downwards into increasing ridiculousness while embracing nearly every single video game story cliche imaginable, including a dead parent, a greedy businessman trying to enslave the world with capitalism, and even a standard evil pharmaceutical company performing illegal tests on humans that might as well have been called “Totally Not the Umbrella Corporation.” I wouldn’t mind the story so much, but it interrupts the gameplay frequently, and if pacing is being sacrificed for narrative, the narrative had better be good enough to justify it. The sheer ineptitude of the storytelling culminates in a clumsily handled sequence towards the end of the game where the player is forced to navigate a raft around a sewer for about five minutes while two characters make side conversation. 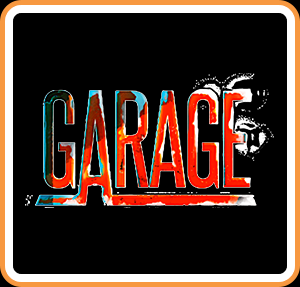 The core gameplay of Garage feels very reminiscent of top down 2D shooters like Hotline Miami, but with a much greater emphasis on exploration and resource conservation. Unlike Hotline Miami’s Jacket, Butch can actually take a few hits before a game over. However, ammo is also limited, meaning that scavenging the area to collect bullets and medkits is almost essential. The result is a much slower paced game, encouraging a high degree of caution, especially since Garage seems to never stop enjoying spawning enemies directly in front of and behind the player whenever story progression is made. 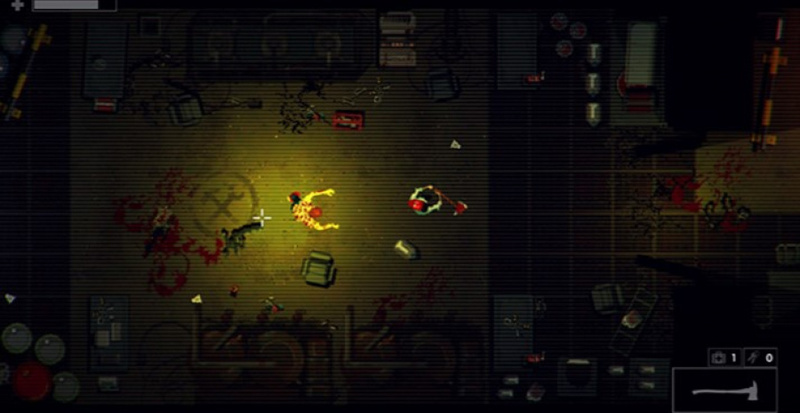 Unfortunately, Garage's departure from Hotline Miami’s fast and frenetic pace proves to be a mistake. In the latter title, virtually every enemy died in one hit, meaning that when the player died, it wouldn’t take long to get right back to where you were. In Garage, however, even the weakest enemies take multiple hits, meaning that if you die (and you will), you will be forced to retrace your steps and slowly kill all the enemies in your path... every single time you fail. There’s no way around doing this, either; you can’t just run past enemies as most of the environments are narrow, making it very easy to get cornered and almost immediately killed. Even if you do make it past, the level design also demands frequent small scale backtracking and stopping to collect/use required items, giving whatever baddies are in pursuit plenty of time to catch up and make themselves a nice Butch sandwich. The process of landing a single hit, dodging out of the way, and then rinsing and repeating is reasonably engaging the first time through an area, but after several retries it quickly loses all sense of enjoyability and merely becomes an annoyance, one that only becomes more grating the more times you have to take out the same baddies in the same dull, repetitive manner. This admittedly becomes less of a problem later on when the player is carrying a much larger arsenal, but the first third of the game is an utter grind while ammo is relatively scarce and conserving bullets is essential. Occasionally, the game will get tired of being a top down shooter and decide that it would rather be something else entirely, usually with very little explanation as to what the player should be doing now. One of the greatest offenders is a sequence where Butch is forced to ride a motorcycle through a narrow underground strip filled with zombies and explosive barrels. This might sound like a generic action set-piece on its own, but the game doesn’t explain how to drive the motorcycle or that the barrels will kill you instantly, so you’re almost guaranteed several frustrating deaths while you try to get a handle on things. On top of that, the game also doesn’t bother to tell you that at the end of the strip, you will have needed to build up enough speed to fly off a ramp and land on the other side of a chasm, so I was treated to death by slowly falling off a cliff. Nowhere had the game told me that I needed to go fast enough to fly off the end; there was no way I could have possibly figured this out save for trial and error. There are also a couple of segments where Garage feels just blatantly unfinished. The game throws a forced stealth section at the player about two thirds of the way through, which is bad enough on its own. Where things really get obnoxious is that, despite the player being unable to proceed unless no alarms have been triggered, the game will continue to let the player play, providing the false expectation that something can be done to proceed. There’s also an utterly bizarre section a short while later where the game sets up a climactic confrontation between Butch and a recurring baddy, but then quite literally cuts to a black text screen that basically says “This would’ve been a really cool scene, but we ran out of time to make the game, so it’s not here. Sorry.” I'm not certain if the game was rushed or if this is just laziness on the part of the developers, but regardless, this has no place in any game that is selling itself as a finished product. A couple other annoyances round out the experience. The game’s only evasion technique, a quick roll, takes up stamina; a reasonable inclusion on its own. However, Garage does not provide a visible stamina meter, meaning that the player is forced to try and mentally keep track of how much stamina they have left. Running out of stamina results in Butch’s walk and attack speed being reduced drastically for a couple of seconds, during which he essentially becomes target practice for the various baddies. In the midst of one of the game’s many frenzied battles, tracking the amount of stamina you have left to the mental checklist is just one niggle too many. On top of this, I’m reasonably confident the game just has inconsistent damage output in some situations. Some fodder enemies that only do a small portion of Butch’s health bar would inexplicably take off 20% every now and then without any other types of baddies around, leading to more frustrating deaths when I had thought that I had budgeted my health out to survive the encounter. Finally, the music, when present, is just utterly obnoxious; consisting of generic electric guitar riffs that grate on the ears very quickly. Perhaps that’s fitting, because if there was ever a word to summarize Garage with, it would be “grating.” There’s certainly untapped potential in the genre of topdown shooters, but this taps into none of it. A bland story with puddle shallow characters and predictable, cliched plot points, poor pacing, and gameplay that is all too often frustrating. Leave Garage in the garage and invite another, more worthwhile game into your home. This review is based on a digital copy of Garage for the NS, provided by the publisher.